Railway surveying has always been of great importance in the maintenance and construction of our railways however late increment in traffic and the resulting pressure to expand capacity has significantly raised the requirement of quick and accurate Railway surveys. With the use of Modern survey instruments, though still requiring some field-work, Railways have benefited from these new technologies. To build new roads, it is important to find ways to speed up and improve the land surveying process can be extremely beneficial. Its physical infrastructure requires planning and monitoring to ensure that we a better connected. Drone solutions address this need by offering authentic real time information. construction equipment with onboard computers that use data from 3-D models and GPS to guide operations—saving time and money as well as improving safety and quality. Our drones carrying high quality digital sensors can be flown swiftly closer to any river structures without erecting scaffolds or ladders, enabling data collection and inspection to be carried out safely. Our monitors on ground displaying the live feed allow teams to jointly assess the inspection process. 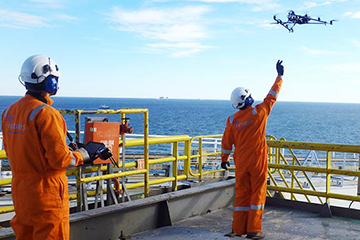 Drones also referred as Aerial Work Platforms (AWP), flying underneath bridges and offshore platforms and looking directly up can provide condition assessment data. The dynamics and rapid development of the construction sector made drones (UAV) an attractive solution for helping in regular inspections of the critical points and taking preventive measures. Sophisticated and modern equipment as well as the Ultra HD cameras provide live feed, providing an opportunity to make quick decisions. Oil & Gas pipelines installations positioned across widespread areas that are difficult to monitor and guard are exceptionally valuable and important assets. As UAV technology has become more advanced and affordable, it has been applied throughout many areas of the oil and gas industry. From construction inspection to scheduled maintenance, UAVs are able to make oil and gas sites both safer and more economical. Using drones for Inspection of Chimney’s offers an affordable solution which makes inspection seem trouble-free in every situation. Here we inspect and survey industrial chimney stacks, cooling towers, stacks and vents, deploying a pro HD camera which enables us to identify defects, cracks and decay and UltraHD image feeds of drone can be used to inspect external structures without the hassle of erecting scaffolds, ladders or cherry pickers. In order to maintain power lines effectively UAVs or drones can be equipped with transmitters that share the footage in real time, allowing the operator to see exactly what is going on at a given time. Drones are able to fly within a couple of metres of the power lines, thus providing high quality footage in the safest possible way. One of the most efficient alternatives to physical inspections is using drones for inspection is (UAVs) are able to carry various cameras for both day and night inspection and can also be equipped with additional sensors such as thermographic and sniffers, as well as having the ability to be programmed to regularly fly specific routes. Yolax Infra group offers specific services aimed at the Telecommunications sector. We understand the complexity involved with building, upgrading and maintaining sites and can tailor our site visits based on your requirements. We can provide high definition images that allow a physical check to be carried out in an efficient, cost-effective and safe way. Photogrammetry can be used in the telecommunication sector for evaluating site environments and localized obstructions to assist with proposed site upgrades.